This post is the second in a series that will provide an analysis of the various hotel reward programs. The analysis of the reward programs will include information on the participating hotel chains, ease of earning points, point redemption options and costs, program tiers, and, finally, an overall evaluation of the program. As more programs are reviewed a side-by-side comparison of the programs will be provided along with the program’s Martini score, our unique valuation for reward programs that will allow you to effective compare programs. Park Hyatt Hotels – Smaller, luxury hotels designed to cater to discerning travelers. Andaz – Our newest brand focused on indulging guests with simple luxuries and unexpected details. Grand Hyatt Hotels – Grand in every sense, these hotels feature luxurious accommodations, dramatic architecture and state-of-the-art technology. Hyatt Regency Hotels – Our best-known hotels feature stylish, contemporary design, abundant meeting facilities and extraordinary restaurants. Hyatt Resorts – Local culture inspires unique experiences rarely found in travel guides at Hyatt Resorts. Experience distinctive architecture, localized spa experiences and gourmet regional cuisine with your stay. Hyatt Place – A new kind of hotel that puts style, innovation and The Hyatt Touch® within your reach. Hyatt Summerfield Suites – Upscale, residential style all-suite hotels with full kitchens that are more comfortable, more stylish, and more like home. Hyatt Gold Passport is a three-tiered program that is known for its generousity in awarding point and free nights. The program is divided into three tiers (see membership levels below) with Diamond being the highest. Exclusive access to the Regency Club™ or Grand Club™ lounge featuring complimentary continental breakfast and evening hors d’oeuvres. Special welcome point bonus or food and beverage amenity during each stay (500 to 1,000 points award based on propery type). Hyatt Gold Passport members earn five points for every eligible dollar spent at Hyatt properties. In addition, Platinum members earn a 15% point bonus while Diamond members receive a 30% point bonus. For example, a $100 night would earn 500, 575, and 650 points for Gold, Platinum, and Diamond status levels respectively. These points represent the standard points awarded for your stay. In addition to the standard points awarded for each stay, there are several other options for earning points: Welcome amenity points, known in the frequent flyer community as “G” codes, promotional points, points earned with car rental partners, and points earned through Platinum and Diamond statuses. Stay 24:2,500 HGP Points, 1,500 travel partner miles, OR Regency Club upgradeThese awards are a nice supplement to the standard and promotional points that can be earned. Even better is the 1,000 points that are available for Diamond members for each stay.For each stay, there is also an option to earn airline miles directly. Five hundred miles are awarded per stay instead of the standard points per night. If airline miles are more important to you than the HGP points, then consider this option just as long as the miles awarded per stay is less than the 2.5 HGP point to 1 airline mile ratio. HGP points can also be earned by renting cars at Avis and Sixt. Earn 300 bonus points for each qualifying rental at participating Avis or Sixt locations. A Hyatt stay is not required, simply request Hyatt Gold Passport points at the rental counter. As a Gold Passport member, you can save up to 20% on car rentals worldwide with Avis. Visit Avis.com and provide the Hyatt Gold Passport/Avis Worldwide Discount number K817700 when making your reservation. At Sixt, Hyatt Gold Passport Gold members receive a 15% discount, Platinum members receive a 25% discount, and Diamond members receive a 35% discount. Discount is valid on all eligible rental rates. Internet rates are not eligible. Call +49 (0) 1805 25 25 25 to book your rental. To receive your discount, be sure to show your Hyatt Gold Passport membership card when you pick up your vehicle. For more information on Sixt car rentals, visit Sixt rent a car. As with most reward programs, hotel reward points can be redeemed for free hotel nights and airline miles. In addition, the HGP program allows points to be redeemed for car rentals. For only 6,000 points per day, an intermediate car can be rented free of charge from Avis® and Sixt Rent-A-Car®. The most likely and common redemption for hotel reward points are free hotel nights. Hyatt hotels are divided into five categories as illustrated by the chart below. The points required for free hotel nights may seem high compared to competing hotel chains but upon closer inspection of the program, the amount of points that can be earned per stay actually puts the program on par with the competitors. A minimum of 5,000 Hyatt Gold Passport points is required for each conversion request. Additional point conversions can be made in 1,250 point increments. Converting 50,000 points initiates a 5,000 point bonus which results in a total of 25,000 airline miles. 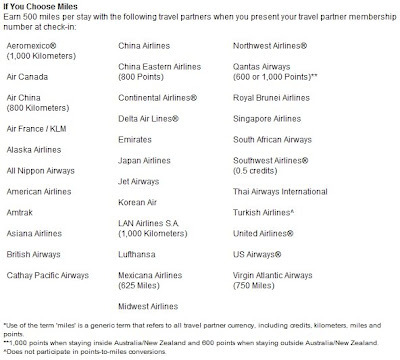 Allow up to 4-10 weeks for the miles to appear on your airline frequent flyer account. The Hyatt Gold Passport program is a great program highlighted by the nearly annual Faster Free Nights promotion. That promotion alone makes this program one of the best in the industry. The recent changes to the program should enhance its appeal and make it one you should consider adding to your hotel rotation.